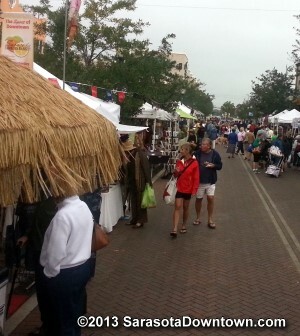 Every Saturday from 7 AM to 1 PM a flea market called a "farmers market" is held in downtown Sarasota. Products ranging from orchids to oranges are available. The Saturday market is located on Lemon Avenue at the intersection of Main Street and on State Street near the new State Street Garage. Some of the available products at the farmers market include artwork, clothing, jewelry, soaps, spices, breads, cookies, pastries, seafood, coffee, live plants, cut flowers and, of course, some actual fruits and vegetables. While there are some actual farmers at the market, as highlighted in a recent news story called "Farm to Fable," be sure to inquire whether you're buying produce from a farmer, or from a reseller who may simply be buying wholesale produce turned down by supermarkets, and simply selling vegetables of no better quality or freshness than you can buy at the local grocery store.